The Dawn was not the only publication produced by, or aimed at women in the late 19th Century and early 20th century. It may not even be the most significant. There are many other sources available to the curious researcher wishing to delve into the past. Here's a few links that may be of interest. Please leave a comment if you have others to recommend. The Australian Women's Archives Project has an online exhibition on women journalists. Which includes a reproduction of a page from the New Idea. Here's a snippet. 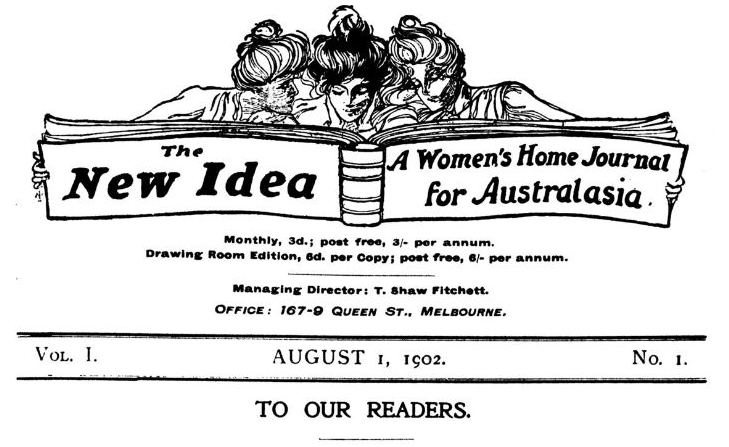 "The New Idea" is a new departure in Australian journalism. No publication worthy of mention has hitherto been published devoted exclusively to the needs and problems of the Australian home and its mistress. Its name reveals its aim—to present the newest ideas continually arising in every branch of woman's life and interest. It will contain, each month. the best that is thought or written, the world over, on every topic which appeals to women. ... We wish to draw special attention to two leading and original features, which alone will make The journal indispensable to every Australian woman. The first of these will be the introduction to Australasia, through the medium of “The New Idea.” of the finest paper patterns in the world. For the first time you will be able to secure paper patterns which will be absolutely reliable, perfectly fitting, thoroughly stylish and up to date, and sold to subscribers at the uniform and low rate of 9d. each, post free. Hmmm, actually, that sounds a lot like The Dawn!